Organizations go through different levels of maturity as they grow. Some will say that they “learn to perform”, others will say that they “become ossified and slow”, yet others would say that they “mature”. In my view neither of these classifications is accurate, they all touch on possible outcomes of a process of “aging”. Organizations grow older, but what dynamics do we see in these organizations? Organizations grow older, they age just like us! A recurring pattern in organizations is that they create, develop and install processes. Processes are, for practical purposes, sets of rules that define how work should happen in those organizations. They are the rules we follow daily when we work. These rules are necessary for a common understanding of expectations and roles for each of us. We need those rules or processes so that we know what to expect, and what is expected of us. Or do we? What is the role for rules in an organization? PS: you can find a much more detailed explanation here. Following these simple rules Ants can not only find food, but feed an entire colony. In fact, when observed from an external view point we see complex System behavior even if one Ant alone follows a very simple set of rules. 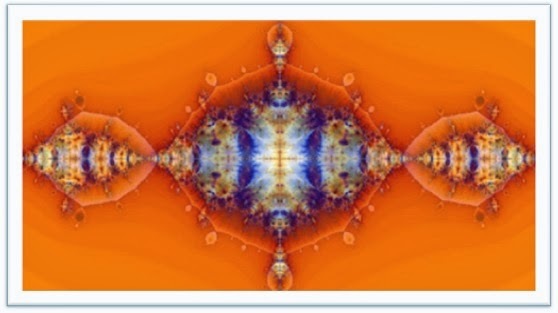 The complex behavior we witness is Complex, and Adaptive. Hence the term Complex Adaptive System (or CAS). What does this have to do with us – humans – and companies? In investigating CAS we have found that the more complex the rules that we define, the less likely that the system (or company/organization) will be Adaptive. In fact, the opposite is true. Companies often put rules in place to “clarify, and specify” the expected behavior, thereby making it simple – or even simplistic. One glaring example of this phenomena is the way companies develop highly sophisticated goal-setting processes that eventually end up setting goals that distort the behavior of the organization in a way that makes it lose sight of what matters: their adapation to the environment they exist in (customers, suppliers, society, etc.). 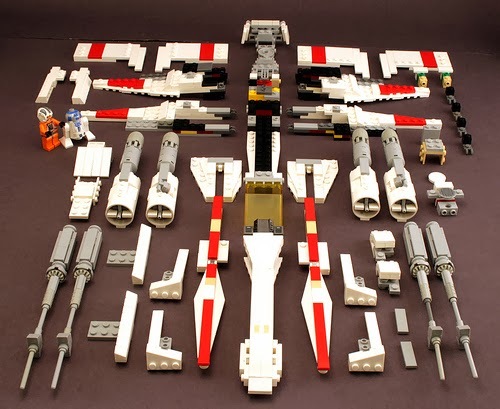 The more complex the process and rules, the less Adaptable the organization will be! But there are more examples of this phenomena whereby defining complex rule systems leads, invariably, to simple – even simplistic – behavior. What’s the role for rules? What is now clear from research, is that simple rules can lead to Complex and Adaptive behavior in the “system” or organization. For us managers, this means that we must avoid the temptation to develop complex set of rules and must be on the lookout for rules that add burden to the organization and possibly constraining behavior to the point that the organization is unable to adapt to the changes it faces in the market. The recipe to foster adaptability in the organization is simple: when possible remove rules, when in doubt remove rules. Add rules only when the cost of not doing so is prohibitive (legal boundaries for example) or when you’ve learned something about your environment that should be codified for everybody to follow (you found out that a certain technology is too expensive or unstable). But here is the most important rule for you: All rules should be created as a result of a root-cause analysis, never as a result of a knee-jerk reaction to some unplanned or unpredictable outcome. The most important rule: No rules should be established without a thorough Root-cause analysis! 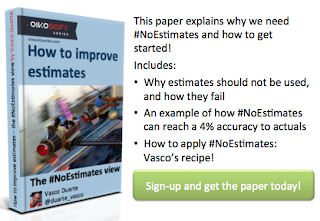 Why do I use #NoEstimates? Certainly the first reason is obvious in the name of this movement. But there are may other reasons. One of the reasons that does not get enough airtime is that it creates more options than using pre-estimated methods to manage software projects. 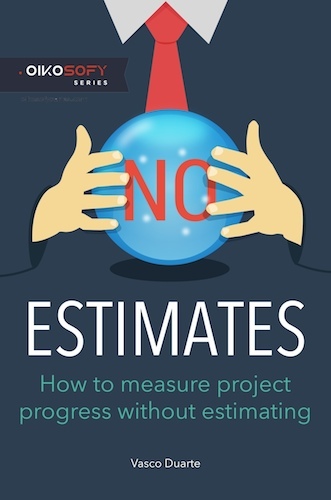 When we estimate a software project we make certain assumptions about what work and how that work will be completed. We need to do that in order to sequence the work, handle the dependencies, assign the work to the right people, etc. Estimation is a process of planning, and as such it requires us to make commitments. Those commitments reduce our options, because we immediately eliminate possible implementation strategies. Let’s look at an example. I want to implement a IT-request queue in my organization. Something that allows us to manage the requests from employees in a way that none is lost and the employee can easily get information on how the item is proceeding through it’s life-cycle. A project is started. How to plan this project? The Estimated approach: In this approach I get the team together we list all the work that needs to be completed (database changes, UI for form input, queries and IT ticket management, server deployment, testing, etc.). We schedule this work according to skills and availability of people and end up with a schedule. This schedule will be implemented by different people. Because of this, I will have to follow-up with each person, to make sure we have each necessary task completed before the work on the next tasks begins. This is how we would typically handle the dependencies between these tasks. The #NoEstimates approach: In this approach I ask the team: “What is the most important work that we need to complete NOW?”. Tracy says: “The IT ticket handling is the most important part. We can add the customer-side UI later and handle incoming requests by email until then”. Bingo! I get the list of tasks for that specific functionality from the team, and it looks much smaller: Database changes + IT UI development. The immediate benefit is that the dependencies are fewer (and we will make them even fewer with User Story splitting), which means less coordination, and valuable functionality delivered earlier. But the key point is this: We have more options! We have made the necessary commitment to deliver something of value, but not made a commitment to the planning for the whole project. One of the key benefits of using #NoEstimates as a planning approach is that we create more Options, making our projects more valuable and more flexible. In the #NoEstimates approach we release a partial set of functionality (value) earlier. We may find that for the time being that functionality is enough and may decide not to release any further functionality (an option). Or we may find something we did not know before, and change the project (another option). While in the Estimated approach we will make commitments in terms of time, people and resource allocation that are going to be harder to change later (reducing options), and may commit more money to the problem than we actually need (less options still). Note also that with the #NoEstimates approach we don’t commit to requirements that we are not going to immediately work on. The reason is simple: requirements have a “best before” date and expire. We should not commit to requirements too far into the future – but that we will tackle in another post. Have you applied this planning heuristic in your projects? What were the benefits, and obstacles you faced when using it?